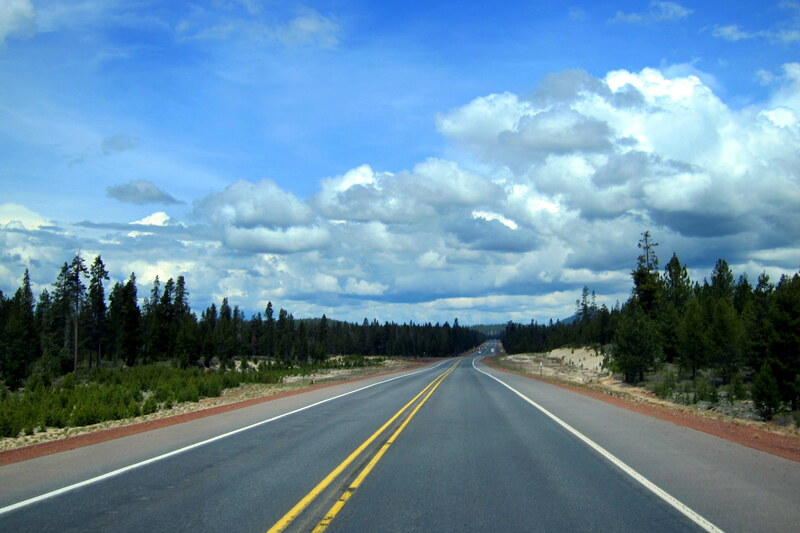 Sometimes the most scenic roads in life are the detours you didn’t mean to take. Saturday, May 16, 2015: Morning in Harbor, Oregon brought a rather unusual looking sunrise. The below horizon sun bouncing off some dense low hanging clouds coupled with the morning coastal fog produced a rather surreal image. Pulled chocks and were on the road at 0940. 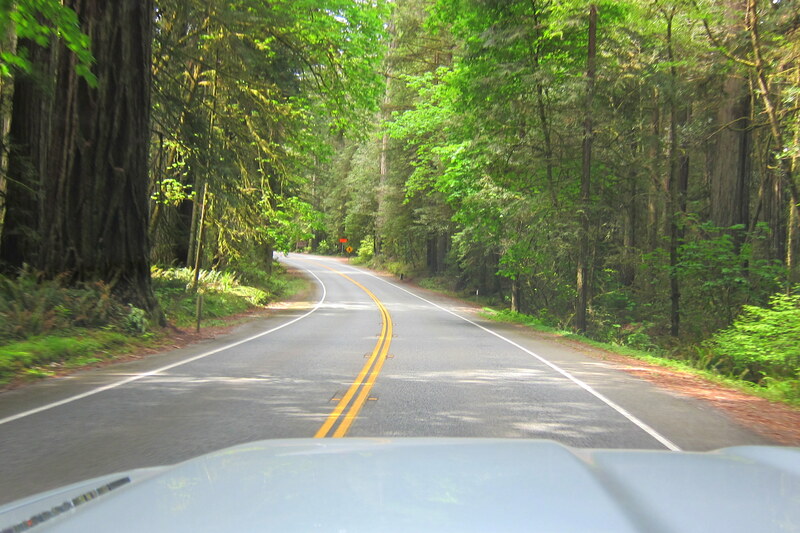 Kit and I decided to head south a short distance in order to pass through the Redwood National Forest of Northern California. In addition to a nice drive through an iconic landscape, this allowed us to conveniently gain access to inland southern Oregon without heading any further north up the coast. Make sense? No, didn’t to us either but it just seemed like the thing to do! Backtracking on US-101 toward Crescent City, we split off north of town and meandered through Redwood National Park on US-191. This park is very similar to Sequoia National Park. 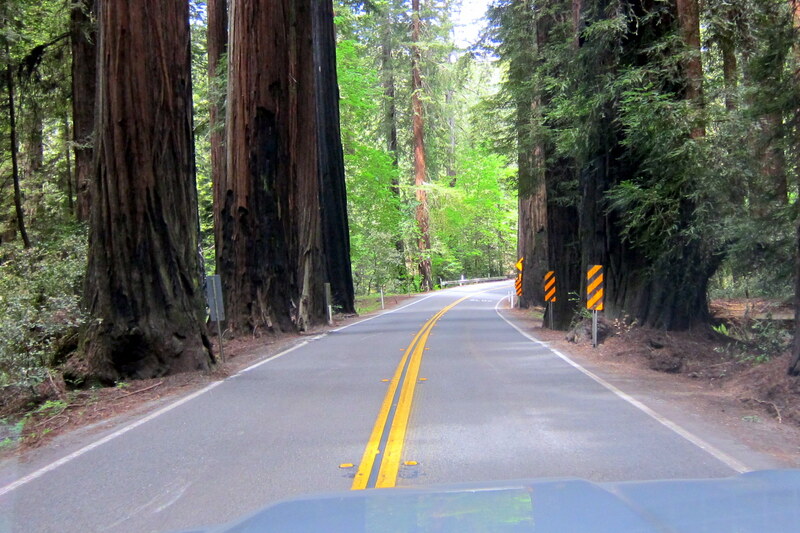 Mammoth sized trees lining a very well thought-out park road that maximizes ones exposure to the forest of giants……and yet another exercise in careful RV piloting. Fortunately, what little traffic was trying to share the path with us was also content to drive at our speed of slow and therefore we all enjoyed the drive through the beautiful landscape. Kit and I decided not to linger in Redwood National Park as we had explored this area some years ago and there were surely adventures to come that we hadn’t yet enjoyed. Leaving the parks northern boundary, we traveled back into Oregon and steadily gained altitude as we left the coastal plains. 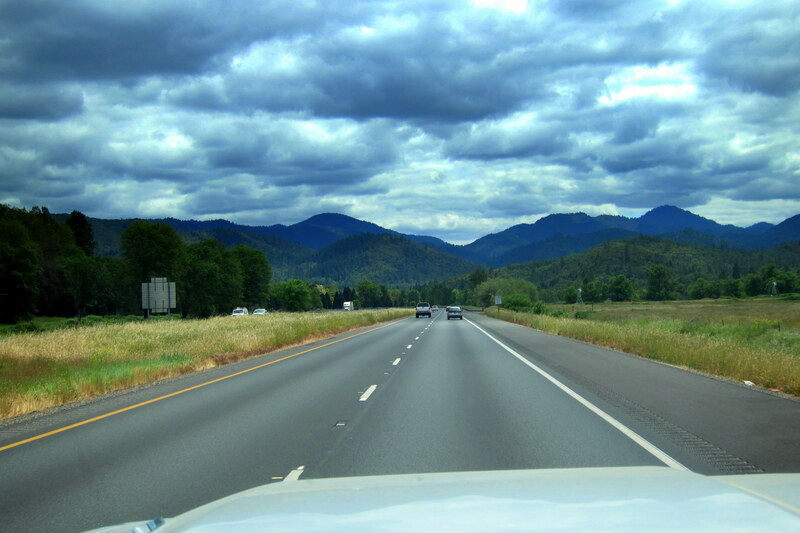 At Grants Pass, we jumped on I-5S, and soon thereafter the skies became threatening so we decided to pull off the interstate and found a convenient Wal*Mart to hunker down and resupply. I stayed in the camper and tried to figure out where to go next while Kit did the shopping. Listening to the rain drumbeating on the roof I got online to do some location vs time vs distance calculations. Kit and I wanted to pay some fellow RV’rs a visit at their summer home in Bend Oregon, but also noticed that Crater Lake National Park was nearby. Having very flexible travel plans, or more accurately no travel plans, affords us the opportunity to make it up as we go along. 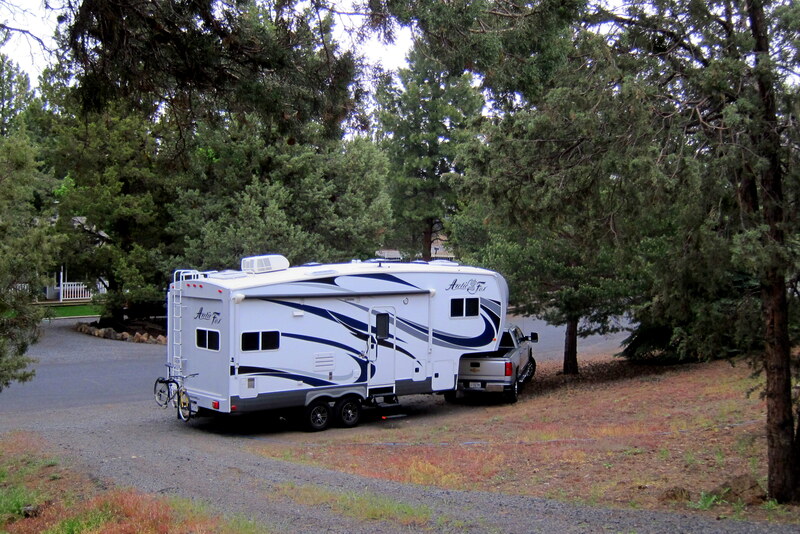 I noticed online that Crater Lake had just opened for the season, a good two weeks earlier than normal, and there were campsites that could accommodate our rig…..so, pending approval of the boss, that’s the plan for the next destination! 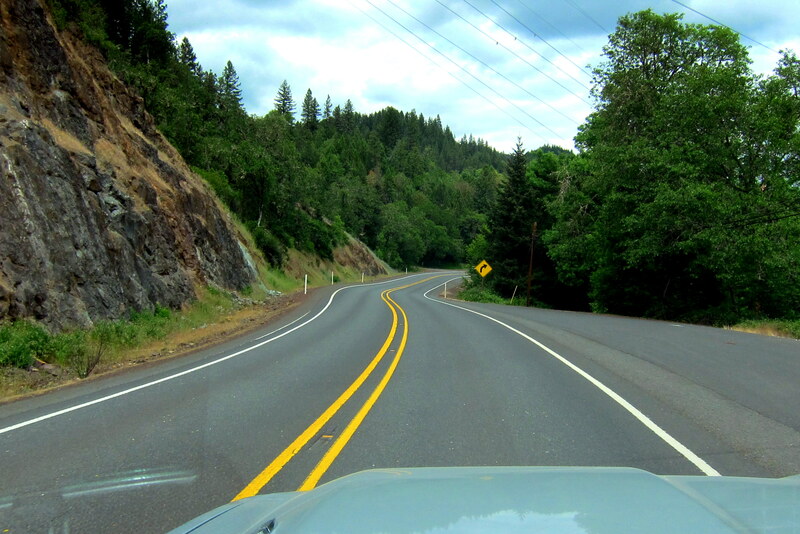 As we were loading the groceries into the camper, I shared my new travel plan with Kit and the trooper she is, said “let’s go!” So, off we trundled through Medford, along the Rogue River Valley, until we left the interstate at Gold Hill and jumped on OR-234/62 heading east toward the park. 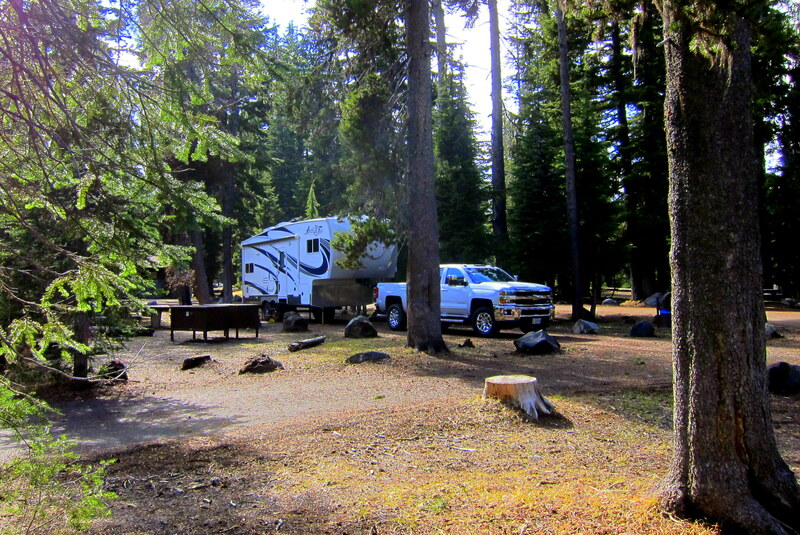 Pulling in, we selected a nice camp spot at sparsely populated Mazama Campground and settled in for the evening. 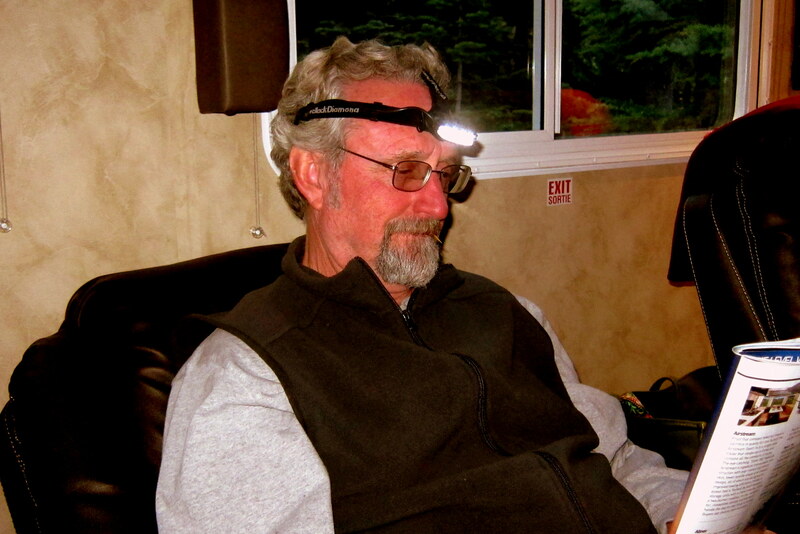 Where, without hookups, and to preserve our battery power, Kit and I sat in our recliners and read by headlamp. Looks weird, but it’s very efficient! The campground sits at an elevation of 6,200 feet in the Cascade Mountain Range and the overnight temperatures are predicted to drop below freezing. So it looks like a couple of evenings of the furnace running…..not a big deal with plenty of propane and two fully charged camper batteries but better to conserve power just in case we stay longer than anticipated. Sunday, May 17, 2015-Crater Lake National Park: Up to a cold and bright morning…..as I took a walk about the area, Kit continued to check her eyelids for light leakage. This early in the season, there are only two out of the six loops open in the campground, so walking the closed loops gave me access to areas of the park that hadn’t seen much human presence over the winter. 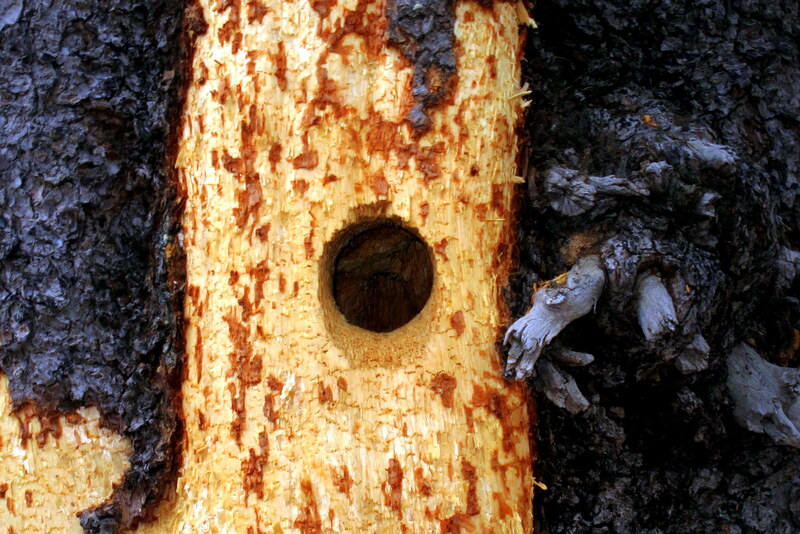 Nearby, I came across a nest in an old pine that was likely built by a woodpecker. I could detect movement in the nest and catch a fleeting glimpse of a little head, but not long enough to capture a photo. I’m sure mom was hovering about and probably a bit stressed so I quickly moved on. Near the far edge of the not yet open campground, I came across this sight. 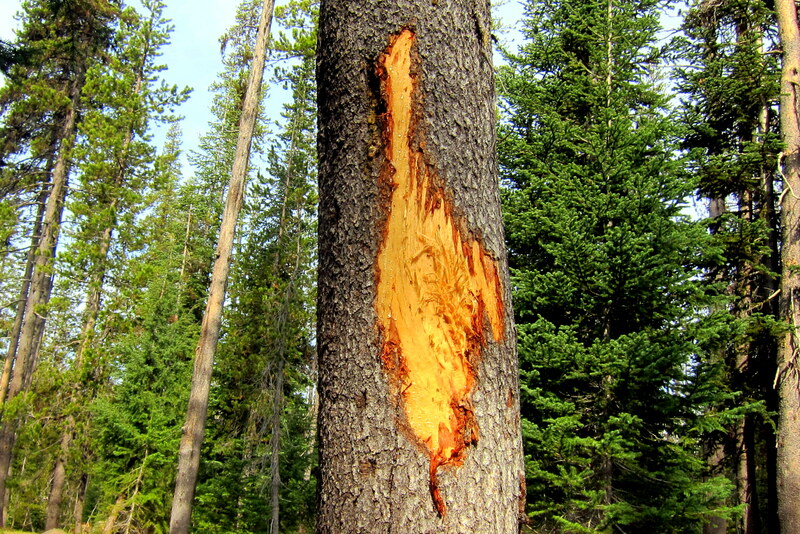 I’ve seen similar markings on trees in Maine but never sure if they were antler scrapes or bear claw marks. This one was likely the latter as there were deep gouges and torn wood fibers evident and the damaged bark was about six feet up from the base of the tree. Back at the camper, we enjoyed a nice breakfast and then headed for the Crater Lake Visitors Center and our first view of the parks striking landscape. 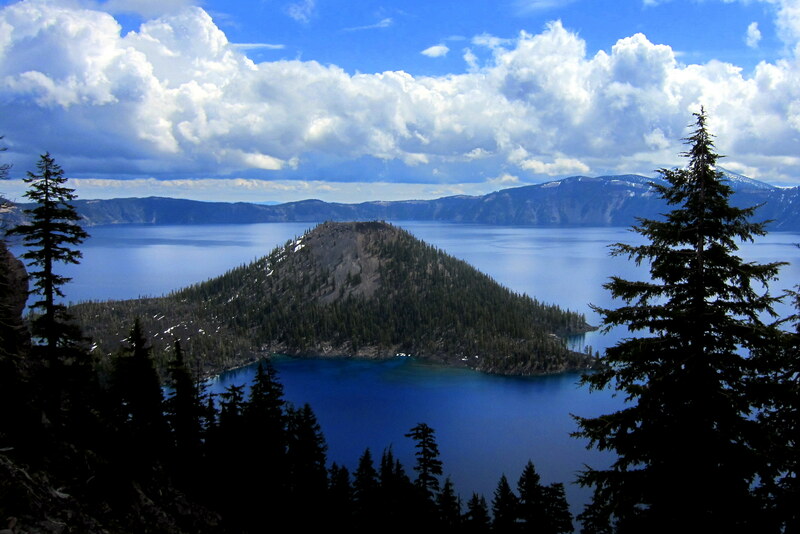 Crater Lake is, well…..a lake in a crater! Or, to be more precise, a caldera from a long extinct volcano full of rain water and snow melt. 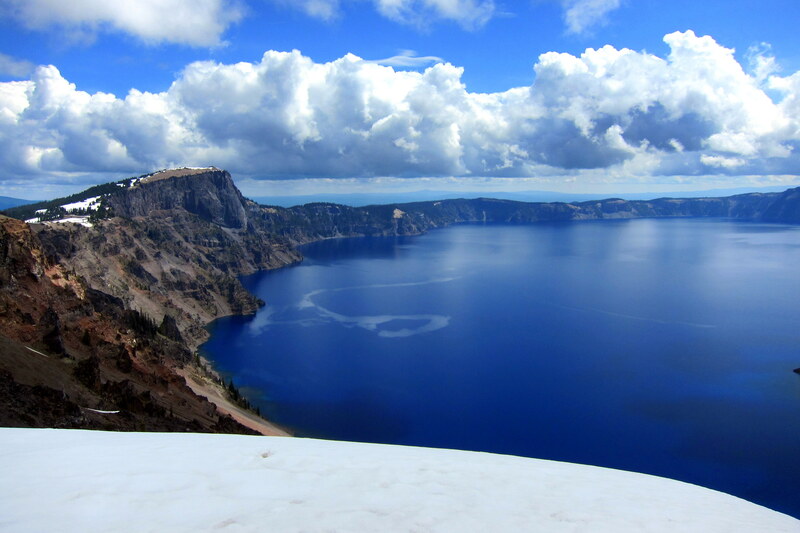 The lake at 1,943 feet has been certified as the deepest in the United States and is fed entirely by precipitation……there are no springs or rivers flowing into or out of Crater Lake. 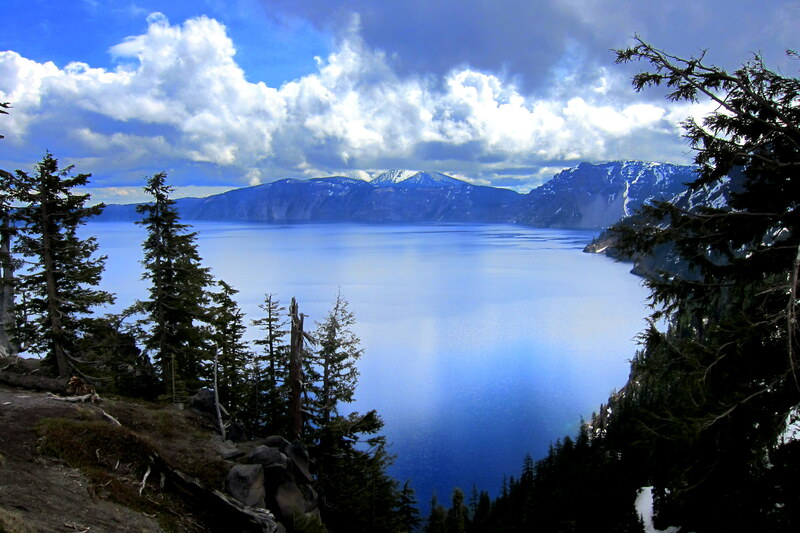 The purity of the water and the lakes immense depth give Crater Lake its famous cobalt blue coloration. Leaving the visitors center, Kit and I drove the famed West Rim Trail, of which only part was open due to the winter snowpack remaining at the higher elevations. 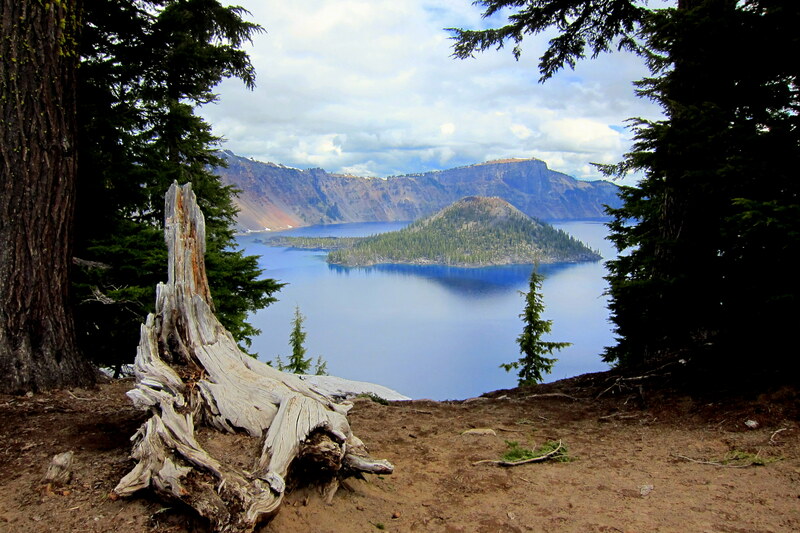 As the name implies the rim trail encircles Crater Lake by following along the edge of the caldera. There are numerous turnouts and observation points that afford the visitor spectacular views of the lake from different perspectives. 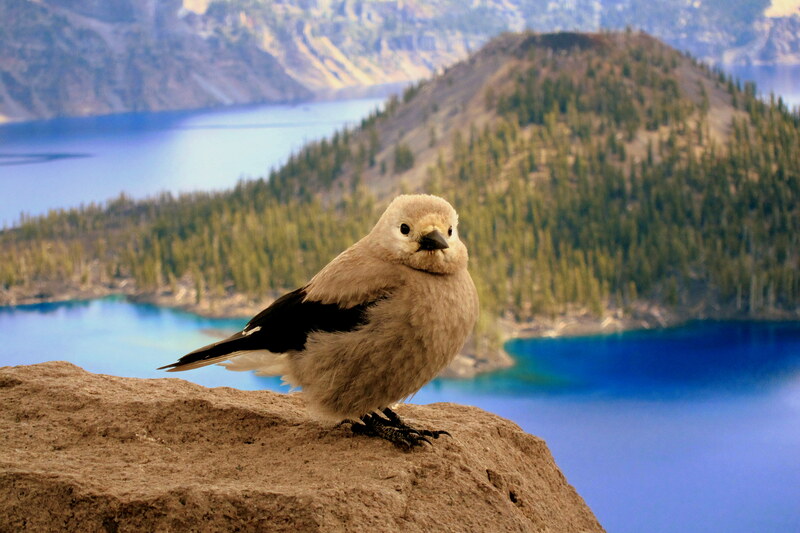 At one of the observation points, this little fellow sat posing and waiting for handouts. It is a Clark’s Nutcracker who dines on pinecones by cracking them open, eating some of the seeds, and burying the remaining to enjoy later. This, of course, helps perpetuate the pine tree’s continued existence as the bird frequently forgets to return to his stash. 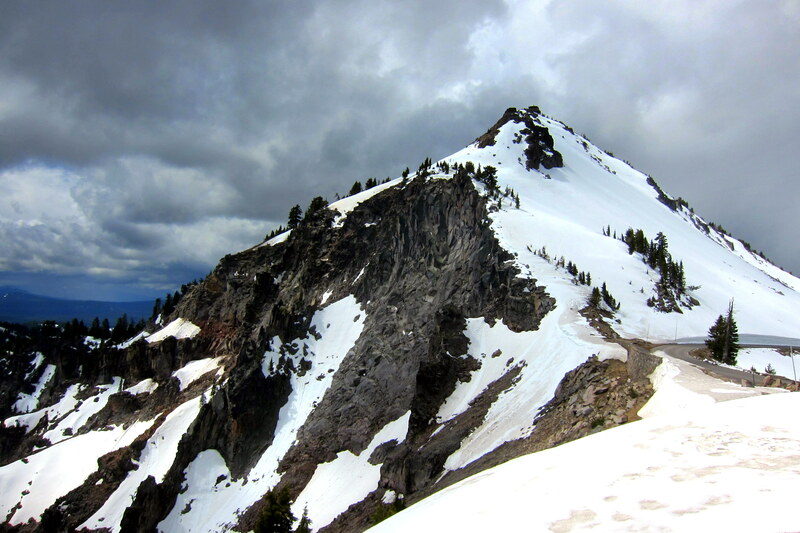 Continuing along the West Rim Trail, the elevation climbs rapidly and the residual snowpack becomes deeper. And at 7,325 feet, Hillman Peak came into view. At this elevation yet another incredible view of this spectacular natural wonder was to be enjoyed. 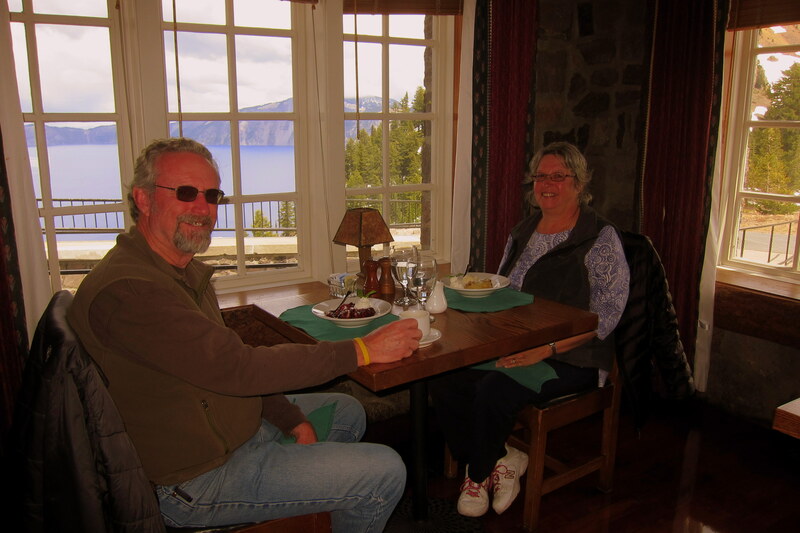 Retracing our route, Kit and I descended to Crater Lake Lodge for a late lunch. 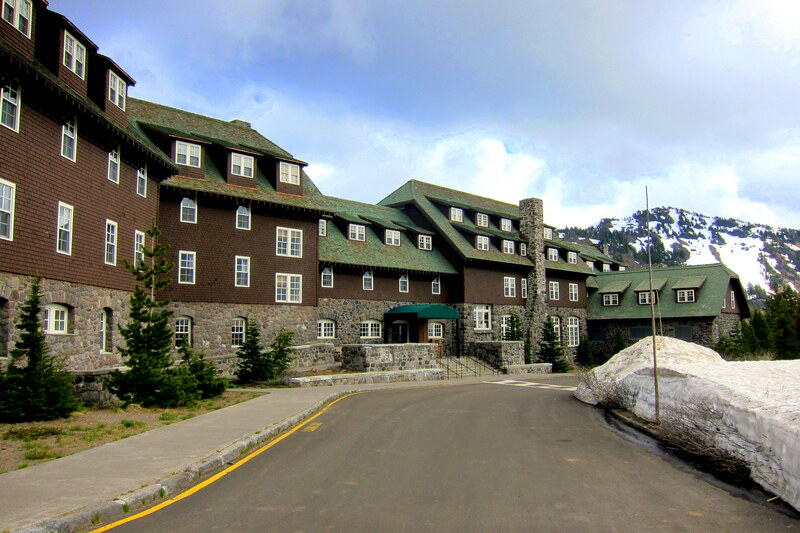 The lodge was built in 1915 and kept simple due to the difficulty in getting materials to the site, the short weather window to build, and to ensure the structure could survive with an average snowfall of 550 inches a year being dumped on it. 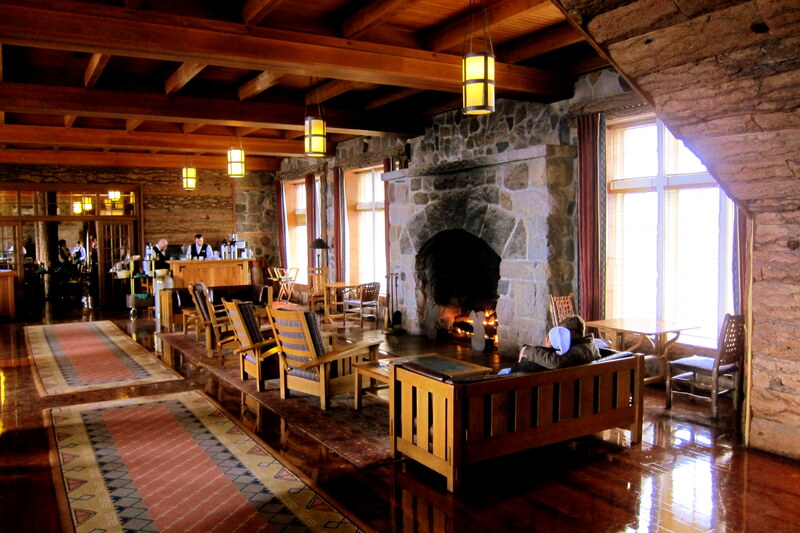 The original lodge was very rustic…..however extensive remodeling of the interior and natural landscaping of the surrounding land was accomplished in the 1930’s by the Civilian Conservation Corps and has since been preserved as a National Historic Site. With a fire roaring in the main fireplace on this chilly day, Kit and I scored a primo table with expansive views of the lake. 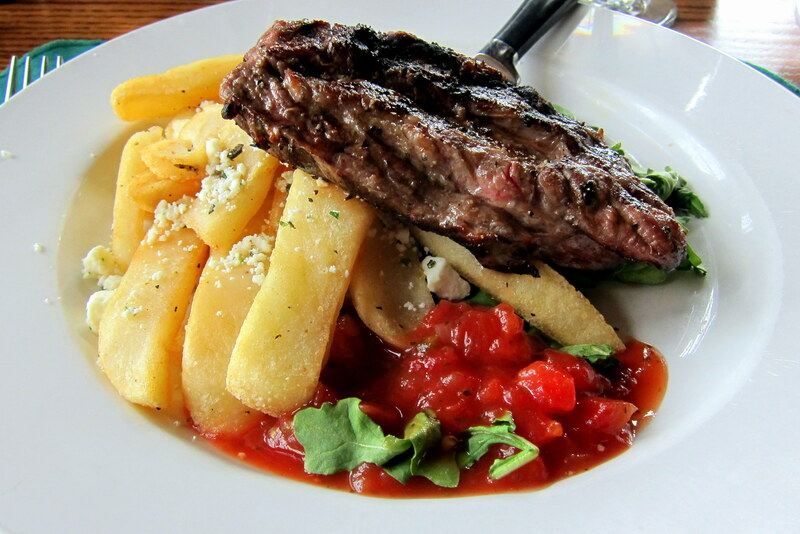 Much of the menu was locally sourced, including the delicious Bison Steak that I enjoyed. 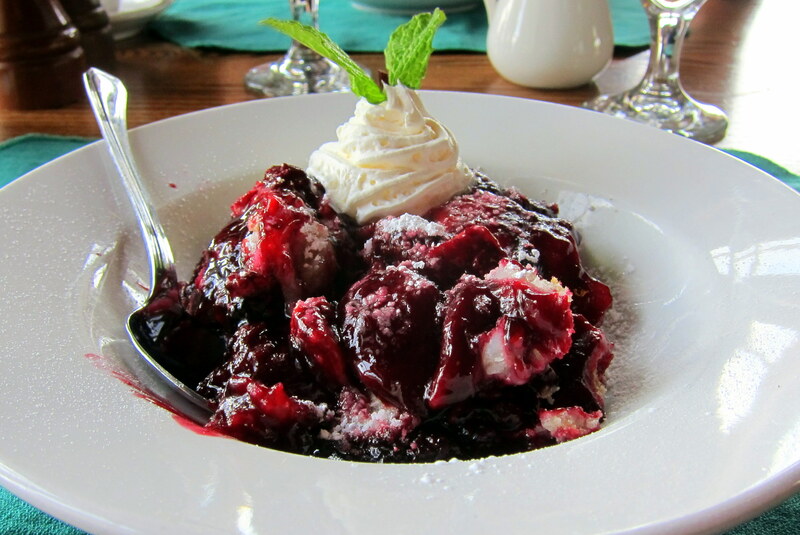 The dessert of Marionberry Cobbler was equally as good! A great day at another of America’s great National Parks! 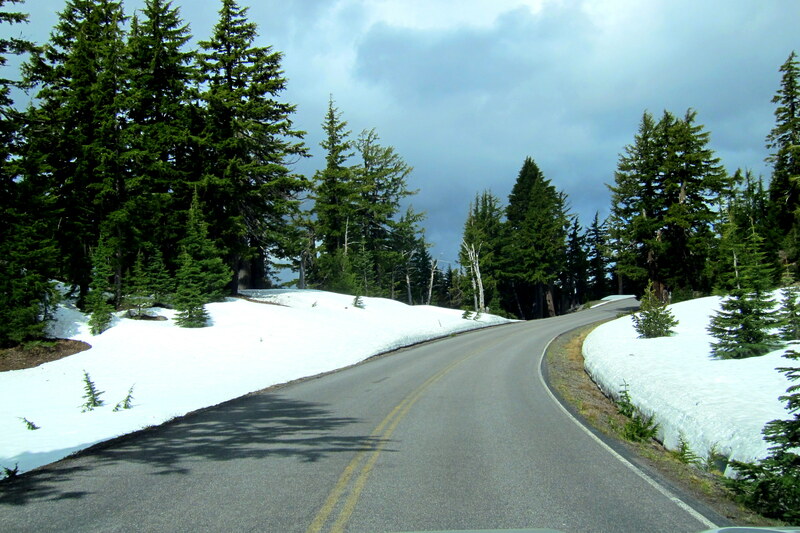 Monday, May 18, 2015: Broke camp and headed out by way of the south entrance of Crater Lake National Park. There is a northern entrance to the park, but at this time of the year it is a bit sketchy to attempt with a camper in tow. The sky is overcast with temperatures in the mid 50’s and there is a threat of rain as we hopped on OR-62 and headed south. Rolling through the town of Fort Klamath, we pulled over to call some RV’ing friends of ours to see if they were available for a visit. 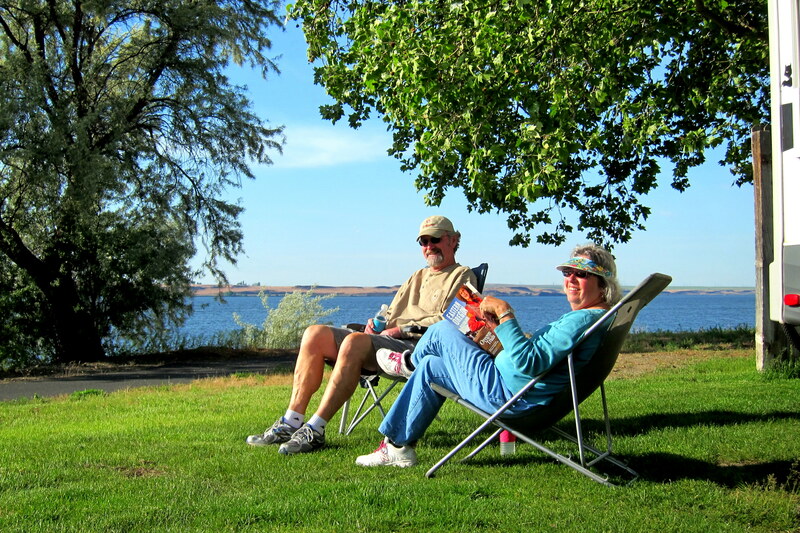 Karen and John Roger live in Bend, Oregon which is about a hundred miles to the northeast. Fortunately, they were home, available, and graciously offered us a place to park for the night! Moving over to US-97N, and following a roadside lunch stop, Kit and I arrived in the nice little town of Bend and pulled into our dooryard surfing opportunity for the evening. 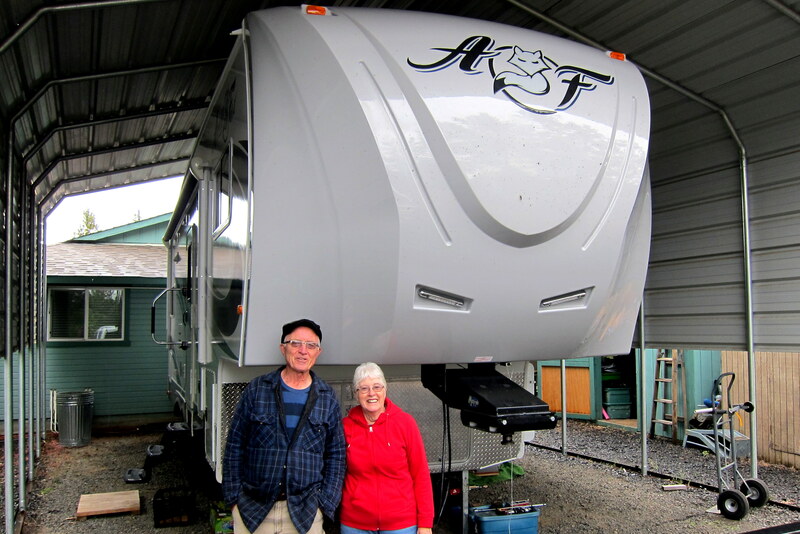 John Roger and Karen, in addition to being long time RV travelers, are a Navy family as well. We connected through our website where they noticed we owned the same brand trailer as Kit and I….in fact they were the impetus for us buying the model we currently own. Well, we returned the favor…..back in February while traveling through Yuma, Arizona we met up with them and they liked our new rig better than their older version so shortly thereafter ordered one of their own. 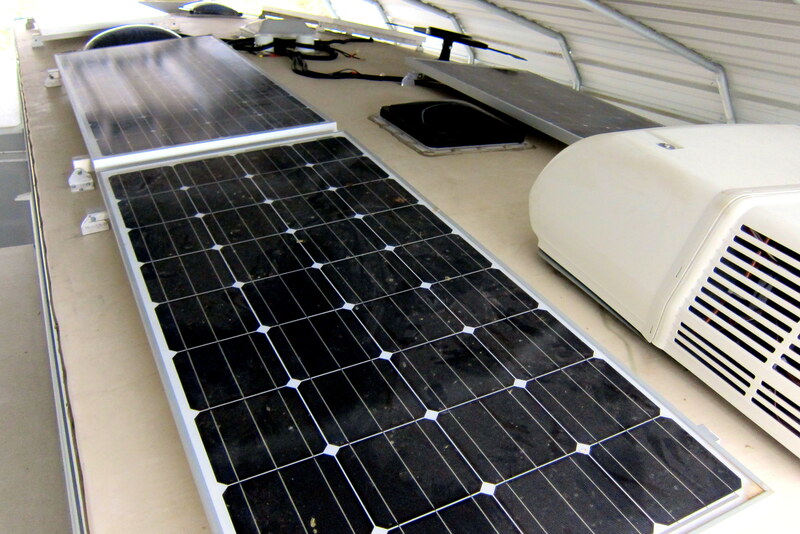 John Roger, being very mechanically inclined has already installed five solar panels and the associated energy management components on the roof of their one week old rig! That level of solar power is needed as they spend the winter on BLM land in Southern Arizona where they boondock…..meaning, camping without any services. John Roger is also a car nut and owns a very nice 1930 Ford Model A that they enjoy driving around in their home town. 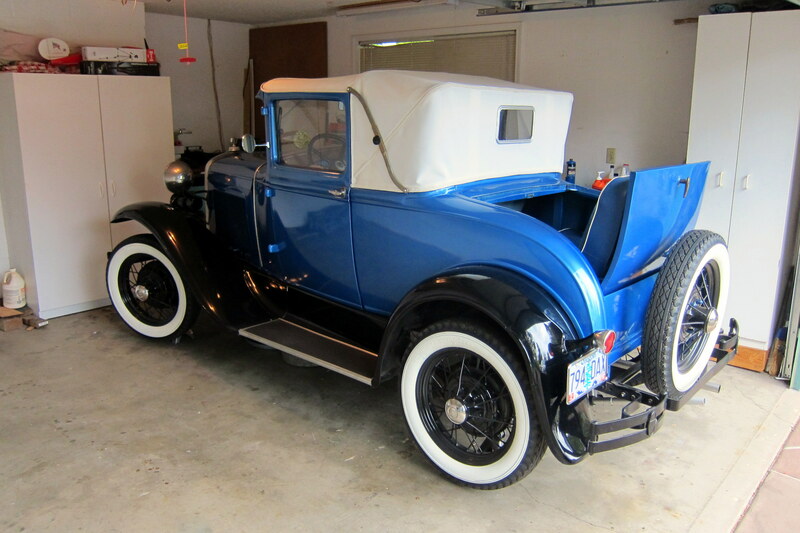 Our friends Jeff and Cathy back home have a similar vehicle and I’ve always admired the lines of the Model A, also…..what’s not to like about the mother-in-law seat? 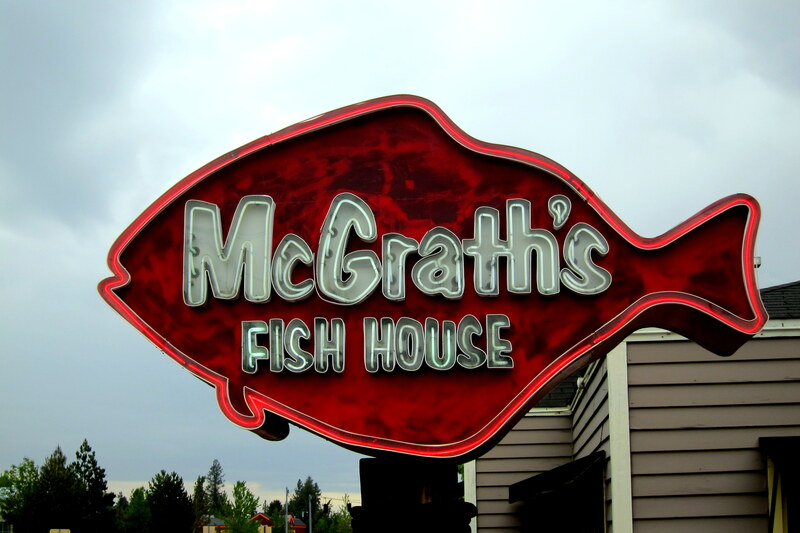 As a thank you for hosting us, Kit and I took them out to one of their favorite restaurants, McGrath’s Fish House. We had a great time catching up on each other’s lives as we enjoyed an excellent meal. 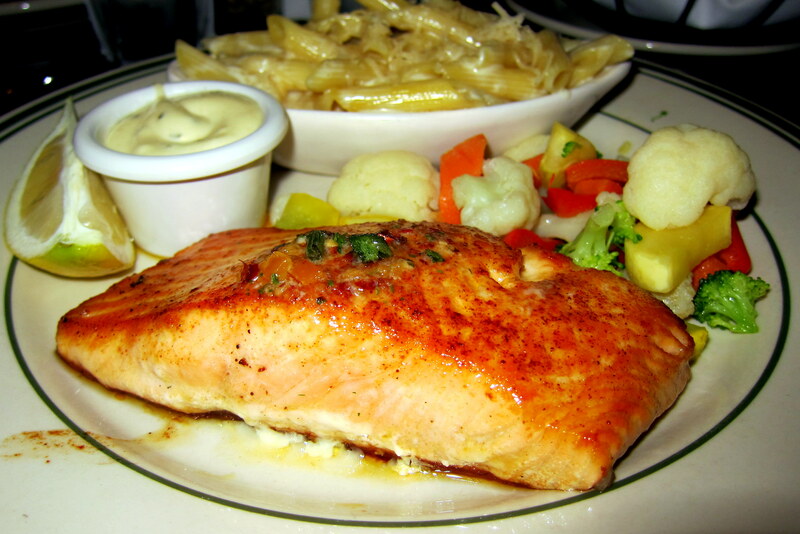 And, an added benefit was the special for the evening being freshly landed Coho Salmon from the nearby Columbia River! The meal as well as the company was outstanding! As we left the restaurant, I noticed a neighbor from back home waving helplessly as he waited for the next customer. 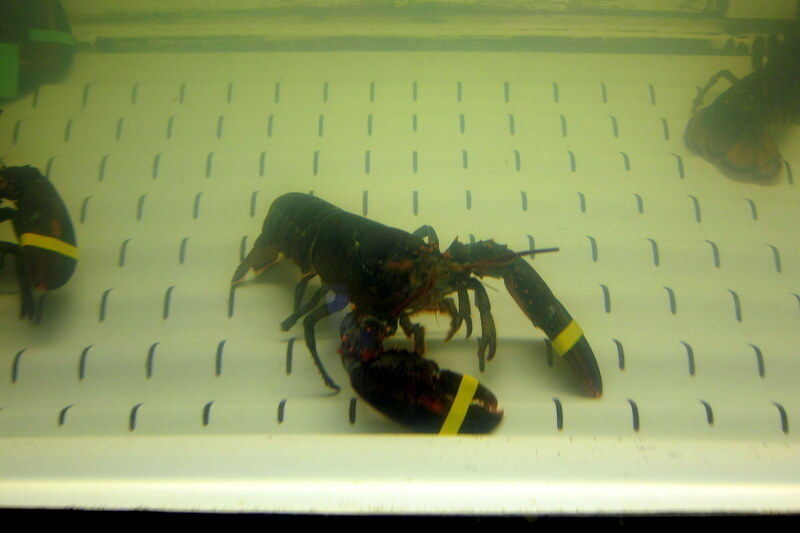 Even though the little fella seemed to behaving himself, I bet he ends up in hot water anyway. Back in their comfortable living room, we enjoyed a glass of wine and visited some more before turning in for the night. Tuesday, May 19, 2015: After coffee with Karen and John Roger and saying our goodbyes, Kit and I rolled out at around 1030 onto the roads of Bend, Oregon. Back on US-97 we headed north through Redmond and the small town of Madras where we started noticing a strange display of public art. 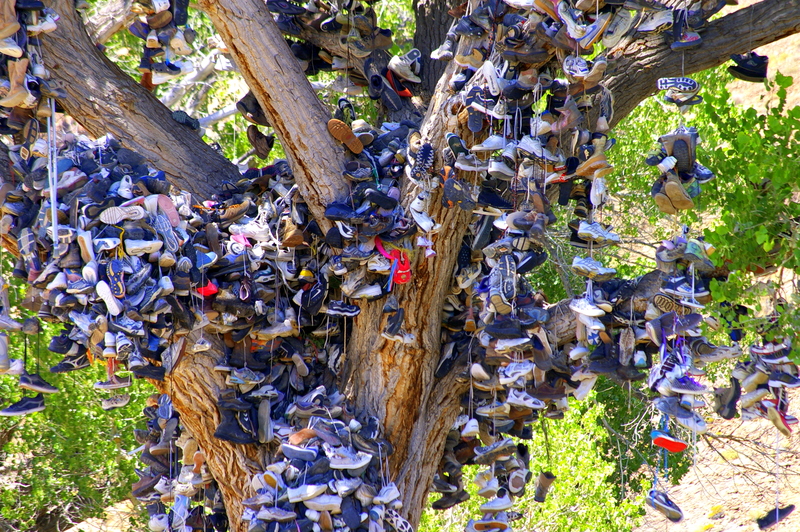 Yep, trees festooned with discarded footwear, mostly sneakers! Not sure who or why but as with most public art projects, does it have to make sense? The geneses of these whimsical creations are, I imagine, the result a bored teenager with an artistic sole (pun intended) and the project spontaneously grew by enthusiastic public involvement. At noon Kit and I straddled the Earth’s Northern 45th Parallel. To our left is the North Pole and to our right is the Equator…..and there both exactly the same distance away! An hour and a half later we joined I-84 and headed east. It really seems weird to be on a major interstate highway after tooling along the secondary roads of America for the past couple of weeks. 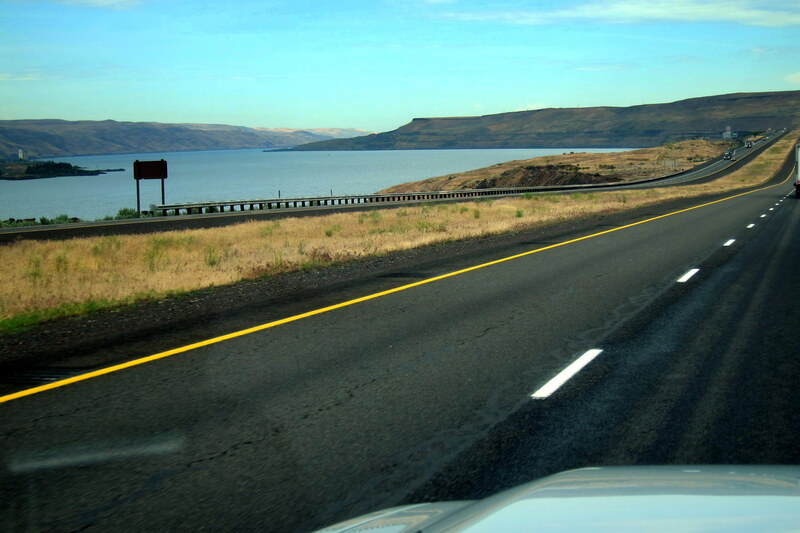 I-84 generally parallels the Columbia River and we kept it in view for most of the rest of the day. 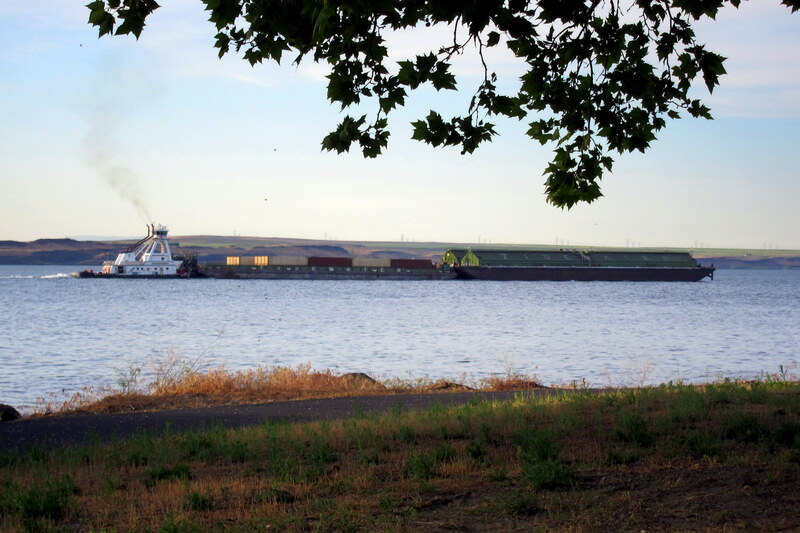 It was interesting to note that back in 1805, The Lewis and Clark Expedition followed this same river. I bet we were moving a bit faster and in far more comfort! 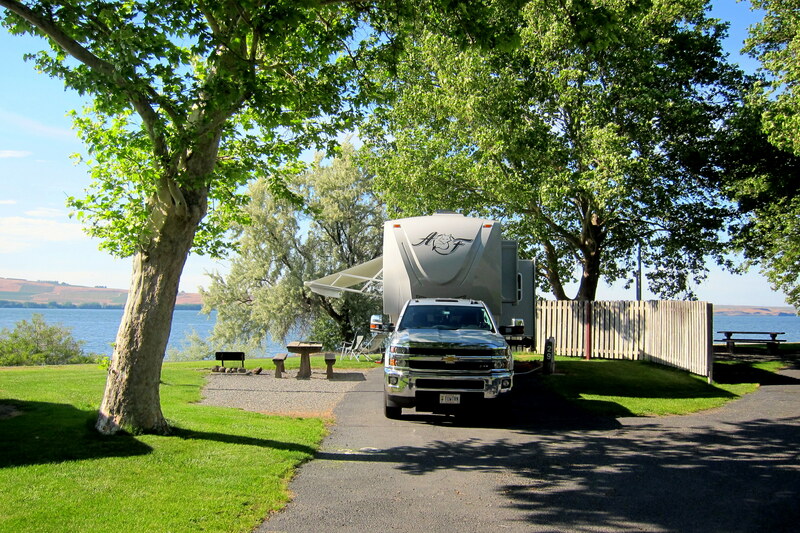 Entering the small town of Boardman, Oregon which is nestled along the south bank of the Columbia River, we stumbled upon a very nice municipal campground and decided to stay the night. The weather was perfect to sit under the trees and read or just plain relax. 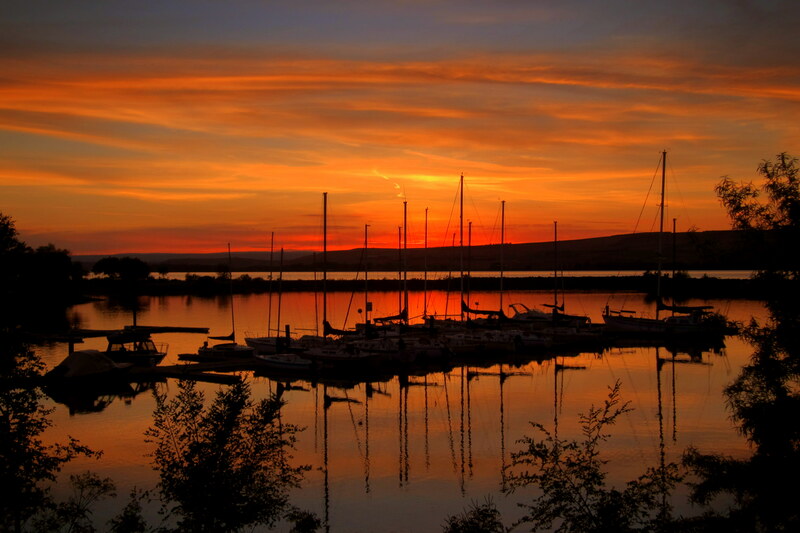 While watching the waterborne world pass us by…..
…..until the sun set in the western sky. Hey, that rhymes! At which point Kit and I took a walk along the riverbank toward the municipal docks and agreed this is a truly magical place. Just one of many in our great land! 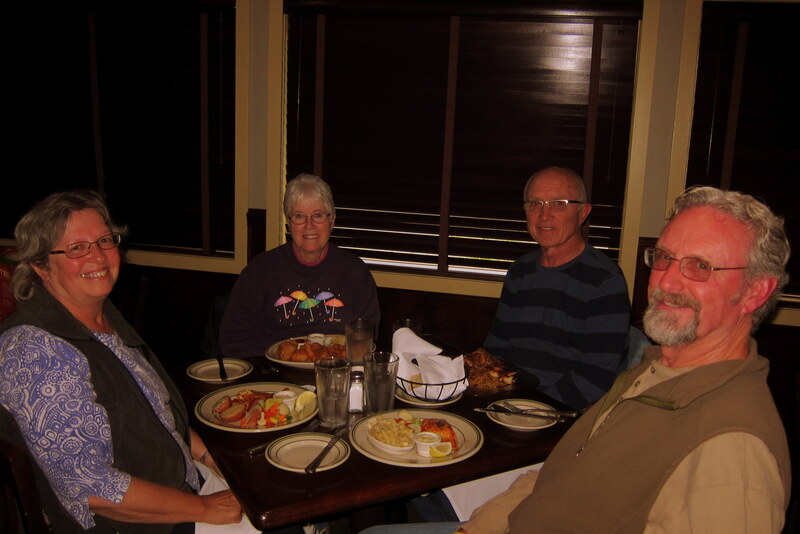 Kit’s Bit’s: As usual, we had a great time visiting with Karen and John Roger. We have many things in common so, never run out of things to talk about. So glad we have connected with them and can see them occasionally. Oregon is such a beautiful state! It’s also a very diverse state since much of it is comprised of desert like terrain. The views, as we drive along, are so pretty! I can only imagine, the pioneers who came west must have been amazed at the scenery before them. Of course, they had more immediate issues to deal with; makes us feel like we’re just sailing through all this countryside without a care in the world. Not quite. Still have to conserve the battery power and ration the water. 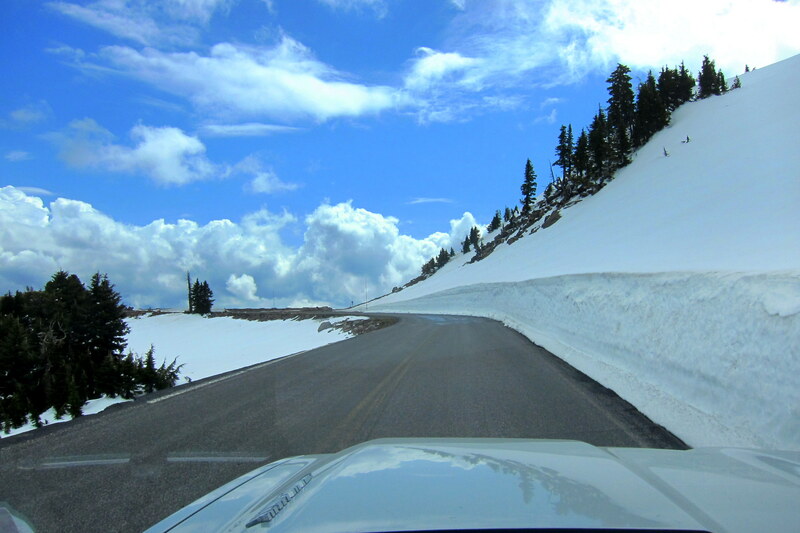 Breath-taking views of Crater Lake——glad you got to see some of the white stuff we put up with all last winter! Happy trails as you head east. It was indeed breathtaking and the photos don’t really do it justice…..I’ve never seen a bluer blue! Wow! 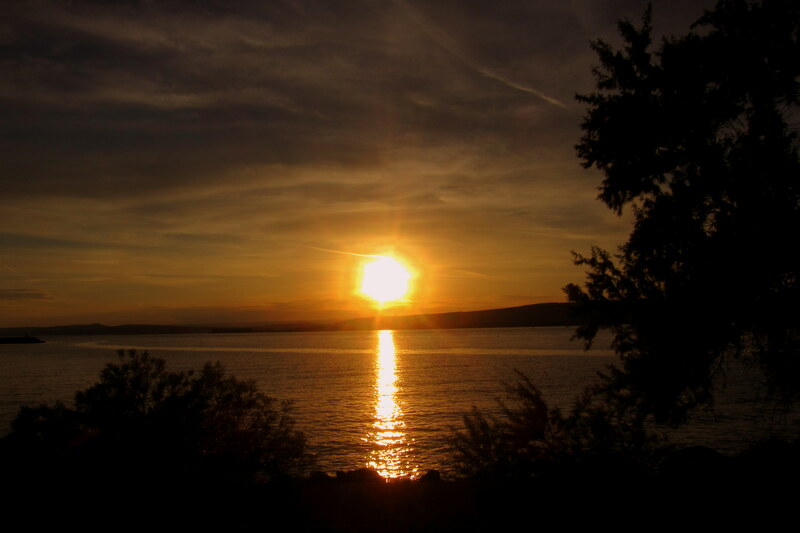 Love the hexagonal sun and beautiful sunset! And Crater Lake!!!! So blue! See you soon. We have company from Wyoming this weekend. 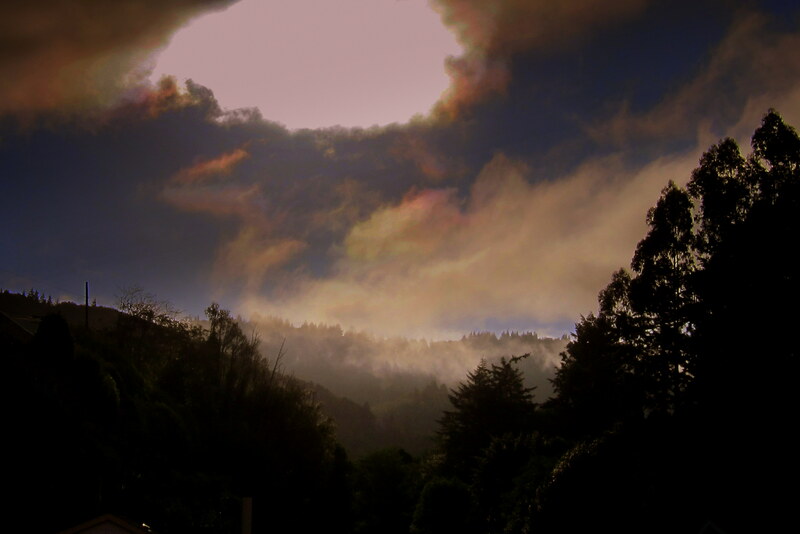 That sunrise was kinda freaky…..never seen anything like it before! Oh my! you did an incredible job of showing off our beloved state of Oregon! Many many thanks for coming for a visit….looking forward to seeing you again, Lord willing! Take care, travel safe! It was great visiting you folks and dooryard surfing in your yard…..thanks again! I thought you would pick up on that! However I didn’t know they were fairly rare. Hope you see you folks soon! Crater Lake is one of my favorite national parks for stunning scenery. It is definitely in my top five for the same reason!